Marion Wachtel was born in Milwaukee, Wisconsin on June 10, 1870 into an artistic family. She was born to a mother who was an artist, and her great-grandfather was a Royal Academician in London. Marion Wachtel studied art with John Vanderpoel at the Chicago Art Institute and with William Merritt Chase in New York City. For two years, she taught art at the Chicago Art Institute and then in 1903; traveled to Northern California. She continued her studies there with William Keith and began exhibiting watercolors in the San Francisco Art Association exhibitions. 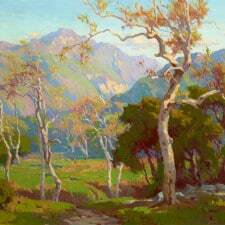 By 1904, she was living in Southern California and was married to artist Elmer Wachtel. Their home was in an art community near the Arroyo in Pasadena, a favorite location for landscape painters of that era. There were beautiful oak, sycamore, and eucalyptus trees lining the valley, and a clear view of the Sierra Madre Mountains. These local scenes became the subjects for many of her watercolors. Both of the Wachtels were pursuing careers as full-time fine art painters so they were able to take extended painting trips to remote areas of California. Often they camped out and explored areas near the coast and inland valleys, seeking out California's beautiful landscape and unique natural light. The works of art they produced on these excursions were sold at art galleries in Los Angeles. By the 1920s, she had developed a personal style of watercolor painting and mastered a technique of slowly building transparent washes of color. After the paint dried, she went back into the work with pastels to blend shapes, soften edges and add highlights. This was to be the height of her career and at this time she was one of the premier watercolorists in Southern California. 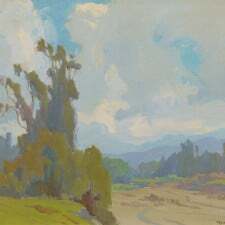 When the California Water Color Society formed in 1921, she was a founding member. Her works were often singled out for special mention in reviews of the period, particularly those published in theLos Angeles Times. When her husband died in 1929, she stopped exhibiting for several years, then began showing oil paintings and watercolors after the mid1930s. She continued to produce watercolors and teach painting into the early 1950s. She died at her home in Pasadena on May 22, 1954. Marion Wachtel’s paintings are in collections of Los Angeles County Museum; California State Bldg (LA); Woman's Club (Hollywood); Friday Morning Club (LA); Cedar Rapids Museum; Fremont High School (LA); Gardena (CA) High School; Irvine (CA) Museum; Orange County (CA) Museum; Santa Fe Railway; LA County Museum of Natural History.